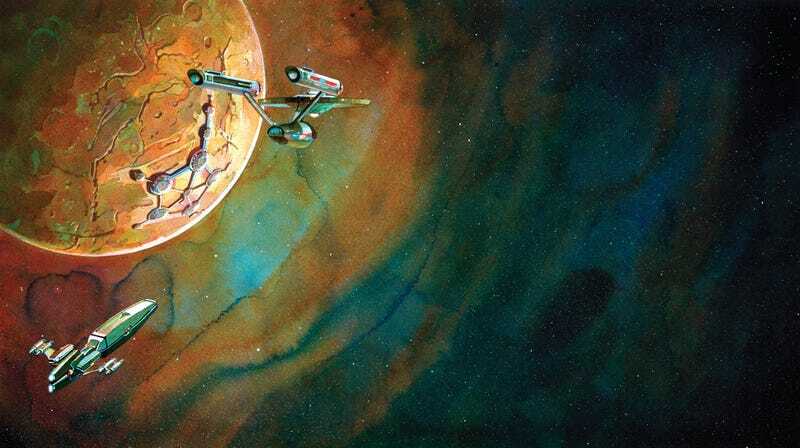 We all know the story of the Federation from Star Trek — how the human race nearly destroyed itself with war and poverty, before turning things around and inventing the warp drive. Now, a new book called Star Trek: Federation: The First 150 Years includes tons of documents and weird details. And we've got a bunch of images from the book, several of which are exclusive to io9! Read James T. Kirk's letter home, discover the truth about human paranoia about Romulan spies, and learn why the Trills decided to keep their true nature secret from humans for so long. There's also some pretty lovely artworks showing key moments in Federation history. The whole thing is written by David A. Goodman, a former writer and consulting producer with Star Trek: Enterprise who also wrote Futurama's famous "Where No Fan Has Gone Before" episode. 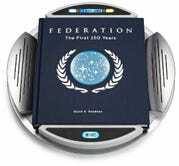 The 176-page deluxe volume, licensed by CBS Consumer Products, is housed in a sleek display pedestal that features electronic lights and audio narration provided by famed actor George Takei, the original Hikaru Sulu. Six chapters covering everything from First Contact to the Organian Peace Treaty and the tenuous peace that followed include nearly 50 original full-color and black-and-white illustrations. These illustrations reveal alien species, historic battles, and ship designs that Trek fans have heard about but never BEFORE seen, including the Xindi Avian, the Romulan attack on Starbase 1, and the original blueprints for the U.S.S. Enterprise. This unprecedented package also features five removable documents, including a handwritten letter from the young Jim Kirk, a document revealing the truth about the Trill symbiont, and Zefram Cochrane's first sketch of the warp drive engine. Top image: Memory Alpha by Mark McHaley. An artist's rendering of the Organian Ayelborne simultaneously appearing in the offices of the Federation president and the Klingon chancellor. Art by Mark McHaley. "The Federation President Ra-ghoratreii and Azetbur, the chancellor of the Klingon Empire, began building the longest lasting peace the two age-old enemies had ever known. The details of the diplomatic document were complex and took years to hammer out. It was clear from the beginning that paranoia still existed within the two governments; one of the articles concerned a guarantee that the parties would never join in a war against each other, and that all past grievances were to be officially forgotten. Article V is also of interest, as it made clear to both Federation citizens and Klingons, who still bore the scars of years of hostility, that they'd be turned over to their enemy if they ever acted on such feelings. Only a small portion of the signatures are reproduced here; they went on at some length, as every member world of the Federation sent a delegate who signed it." Exclusive to io9. "Robert April was commissioned as captain of the U.S.S. Enterprise on April 11, 2245. The commission harks back to the naval traditions of Earth that Starfleet still embraces to this day." Exclusive to io9. An addendum — exclusive to io9. James Kirk's letter home. Now you can forge his signature! Office of the President of the Federation, Paris. Exclusive to io9. Matt Decker as a young officer. Art by Cat Staggs. "A popular propaganda poster from the war that appeared all over Earth, translated into many languages"
"The Vulcan philosopher Surak grew up in a world plagued by war and on the edge of self-destruction. As a young man, he fought in those wars in the infantry; he attributed much of his later philosophy to the changes he underwent during this ordeal. In this section from the original first draft manuscript of his teachings, Surak relays his experience in escaping from captivity into the Forge, an area of Vulcan decimated by nuclear war. This was the beginning of this pilgrimage; his experience there would shape his attitudes toward emotions." All the stuff that comes with the book, including the decorative pedestal that you can insert it into.